Wincent Weiss en tournée en Amérique du Nord ! 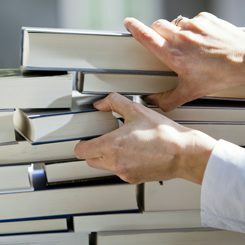 In our ongoing efforts to connect the art scenes in Canada and Germany, we asked prominent Canadian authors to present their “favourite German book” to our visitors and readers. The result was a collection of personal appreciations of favourite or most important or loved or most influential books. One of the books that has traveled with me, from Vancouver to the Netherlands, to Cambodia and now to Montreal, is Hannah Arendt's Men in Dark Times. It's a book unlike her more renowned works, and its subject is other people and other lives. My first exposure to Thomas Mann was in an undergraduate humanities course where we studied Death in Venice. The reader we used included a number of obscurer works by Mann that I suspected had been tacked on as filler, one of which was the novella Tonio Kröger. Last year, at the end of February, I visited Germany for the first time. I landed in Munich and then went by train to Cologne and Berlin. A Jew’s first visit to Germany is no small matter, even today: it remains fraught with apprehensions, neuroses, and a kind of bitter, sorrowful indignation. I first smelled her in late August of 1992. My original year away from home, I was a lonely graduate student in foreign New Orleans. And I realize now that saying “I smelled her,” sounds far too unattractive, much too gauche for how this particular story continues to unfold. In the green duffle bag I carried there was a two-volume set of the Oxford English dictionary, a pair of jeans, two t-shirts, a few pens, a Palestinian kaffiyeh, a notebook and Bertolt Brecht. When I was making the choice about what to put in the duffle bag it was always clear that the dictionaries and Brecht would go with me.